If you're looking for a quick and inexpensive homemade gift idea, consider learning how to make key chains with beads. These pretty key chains are easy to make and sure to be appreciated by your friends and family. They are also a good way to use up beads that you may have leftover from other projects. Cut a length of wire measuring four or five inches. Ideally, you want to use 18 gauge half-hard wire for this project. A key chain takes a lot of abuse in your purse or pocket, so it needs to be as durable as possible. To learn how to make key chains with beads, use pliers to create a loop for attaching a large beaded pendant to the end of the wire. String two to four additional beads on top. 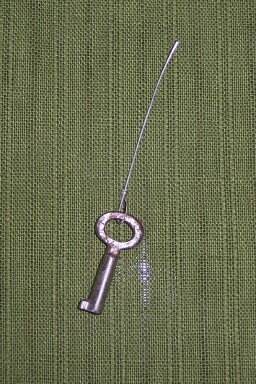 Thread the wire through the hole in your key chain, then use your pliers to bend into a loop. There are endless ways to vary this simple project. If you prefer the look of dangling charms, cut a length of chain and attach your favorites with jump rings. To make a gift for your favorite glamour girl, attach a small lip gloss to the end of the key chain. Want more simple ideas for handmade beaded gifts? Check out the LoveToKnow Crafts tutorial on How to Make Beaded Bookmarks.